The ideal website user experience means satisfied visitors, more clients, and increased revenue. 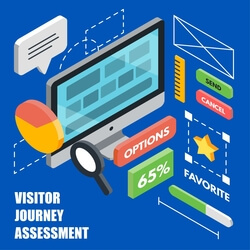 Our Visitor Journey Assessment will point out what your website could be doing better from a visitor’s perspective. It explains what you must do to streamline your business’ website by analysing design, content and traffic data. You’ll receive an actionable list of suggestions and improvements that, once implemented, can reflect positive results in the website’s user experience. These may be conversion rate improvements, higher user engagement, and increased traffic retention.